Springfield, Mo. 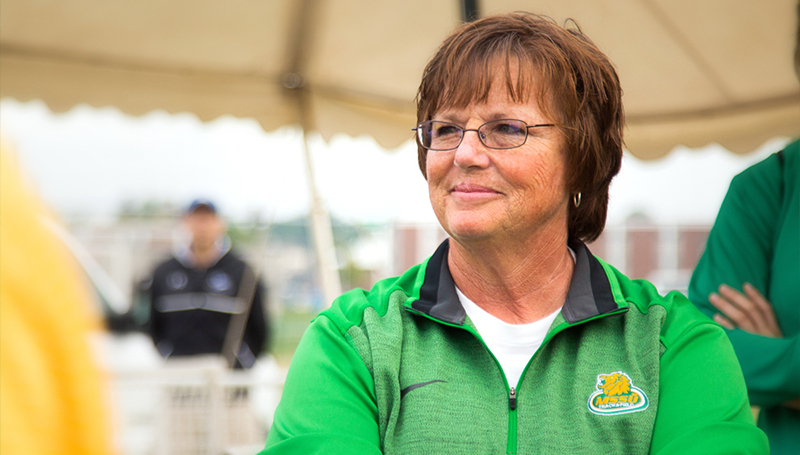 — Former Missouri Southern women’s track and field and cross country coach Patty Vavra, as well as the Missouri Southern women’s track and field and cross country programs will both be inducted today into the Missouri Sports Hall of Fame as part of the organization’s Women’s Sports Luncheon. The event, which is sponsored by the Bee Payne Stewart Foundation and presented by Central Bank and Central Trust is held at the University Plaza Hotel and Convention Center in Springfield. Vavra coached the women’s track and field and cross country programs at MSSU for 22 seasons, guiding 43 individuals who earned more than 80 track and field All-American and 10 cross country All-American honors. She earned 12 Coach of the Year honors from the MIAA (Mid-America Intercollegiate Athletics Association). Under her guidance, the 2009 cross country team won the NCAA Regional, its third consecutive, and placed third at the NCAA Division II national championships. In 2007-2008, the MSSU women’s cross country and indoor and outdoor track and field teams combined to win the MIAA Triple Crown. Overall, Vavra’s cross country teams won seven MIAA championships, while indoor track won two conference titles, and the outdoor team won it all three times. Previously, Vavra coached Carthage High School, guiding two individual state champions. The women’s track & field program has enjoyed numerous successes throughout its history. The indoor team won the MIAA (Mid-America Intercollegiate Athletics Association) in 2004 and 2008, while the outdoor team won the MIAA in 2008, 2009 and 2010. Since 1994, the program has produced four national champions and more than 100 All-Americans. The women’s cross country program has long produced memorable moments and athletes. Since 1994, it has produced 10 All-Americans and 35 All-Regional performers as well as four MIAA champions. The program’s 2007, 2008 and 2009 teams won an NCAA Division II Regional, with the 2009 team placing third at the NCAA D-II Championships. Additionally, the Lions have won the MIAA Title seven times (1998, 2006, 2007, 2008, 2009, 2012 and 2014). Vavra and the women’s program will join Jacquie Dowdy, who earns the President’s Award, as well as the Diamond High School Volleyball Program, Central High School and Drury University swimmer Michelle Langsford Dickemann, former Eldon High School and Camdenton High School volleyball coach Ann Gulshen, and longtime Missouri State Lady Bears basketball assistant Lynette Robinson.